Portable Cabins for Hire & Sale throughout the UK. We Specialise in Portable Cabins for hire and sale. Including, portable cabins, toilets, offices and modular buildings. Cabins 4 Hire specialise in hiring and selling portable cabins to businesses throughout the UK. We offer cost-effective solutions for companies seeking affordable portable units, with competitive prices for cabins, modular buildings, toilets, and much more. All portable buildings from Cabins 4 Hire are supplied from our Gloucestershire site, with delivery and installation available throughout the UK, including London, Birmingham, Cardiff, Bristol, and many other locations. With more than 20 years industry experience, Cabins 4 Hire understands the importance of reliable portable buildings. 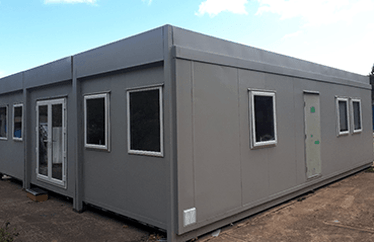 Whether portable cabins for a temporary construction site or a modular building for long-term projects, our units provide all the essential features for temporary accommodation and worksites of every shape and size. Specialising in pre-owned portable cabins, these fully refurbished units come with everything you require for temporary accommodation. Available in a range of sizes, our portable cabins are spacious, secure, and designed to maximise efficiency when working on site. For those seeking larger accommodation, our modular buildings are suitable for long-term projects that have more diverse requirements than a basic cabin offers. Each modular building is flexible in design, so can be tailor-made for any client’s specific requirements – it offers all the advantages of a permanent building but with the affordable price of a temporary one. Please see our main services offered with further information on them and our available cabins for hire and sale. What we Offer in more detail. I took Buy Xenical only strictly during the meal. My weight hasn’t changed, but I experienced side effect such as diarrhea, which I had to treat additionally. It was then later, the doctor explained me that I probably overdo the dosage of Orlistat pills. Safe and secure portable cabins are available for hire and sale throughout the UK. All cabins are pre-owned and completely refurbished to ensure they remain in top condition, with a range of sizes available to suit all projects. Portable cabins are simple to install, allowing us to have them setup and ready to use in no time, which is ideal for those projects on strict deadlines that want to keep delays to a minimum. They can be hired for as long as you need them or sold outright depending on your requirements. Please note sometimes people refer to portable buildings as Portacabins or Portakabins this can only be referred to if selling a genuine Portakabin made by Portakabin Ltd as it is trademarked. Modular buildings are a great option for those large-scale projects. As a modular building, they have much more features compared to a portable cabin yet remain a cost-effective solution. While intended for long-term use, they are available for shorter leases if necessary. The modular buildings include modern amenities such as heating, lighting, power sockets, and double glazing, while we can also fully refurbish a building to accommodate your requirements. These can be used for a range of applications, from offices to canteens to schools. Every worksite requires toilet facilities, so we provide a range of affordable portable toilet and shower block units for hire. These make life on the worksite much easier and with our affordable rates you get exceptional value for money. To ensure you get the most from your portable cabin or modular building, we provide a full delivery and installation. This ensures your units are up and running with minimal disruption to your work, while saving you the hassle of installing anything yourself.